When do you use a comma with which and who? (1) Look at the clause that starts with which or who. (2) If you'd be happy to put brackets around it or delete it, then use a comma. (3) If you can't put it in brackets or delete it, then don't use a comma. The car which hit the snowdrift is a write-off. The car that hit the snowdrift is a write-off. There is often confusion about when to use commas with who and which. Unfortunately, there is no simple rule. Sometimes there should be commas and sometimes there should not. The rule is: When the information provided by the clause is required to identify the person (or thing), then there are no commas. The examples will make this clearer. The boy who broke our window brought some flowers to the door. The driver who stole indicator bulbs for his own car was given a formal warning. Mr Jeremy Buxton of 16 High Street who was born on the Isle of Wight is the second person from the village to represent England at Cluedo. Sarah has always been close to her parents who live in the same village as us. The boy who broke our window bought me some flowers. The boy that broke our window bought me some flowers. The PC which keeps breaking down is under guarantee. The PC that keeps breaking down is under guarantee. 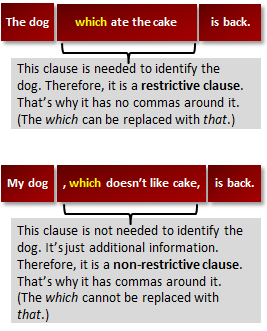 Quite often with a restrictive clause, you can remove the who, which or that altogether. The reprimand which you received was justified. The reprimand that you received was justified. The reprimand you received was justified. Look at the sentences below. Both are grammatically correct, but they are slightly different in meaning. Sarah has always been close to her sister who lives in the same village. Sarah has always been close to her sister, who lives in the same village. In the first example, you can assume that Sarah has more than one sister and that Sarah is close to the one that lives in the same village. In the second example, you can assume that Sarah has only one sister. 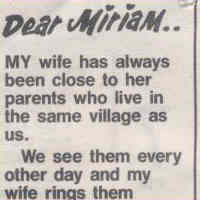 As it happens, she lives in the same village as Sarah.